Being a host, one has to send invitation cards to the guest for the very special day of your life. 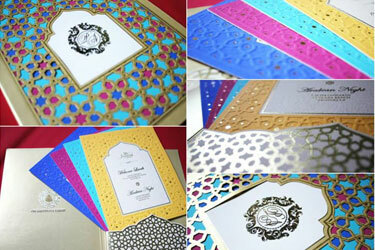 The invitation card should be such that it depicts occurrence of your wedding related programs in sequential order. The invitation should be simple, sober and at the same time attractive. It can possess date wise details of programs, names of near and dear ones, contact information. Even online invites are also sent apart from cards. What matters the most, is the look, feel, embellishments, choice of words which speaks the personality of the host sending the card. Whether you want an elegant one page handmade paper card or a mini booklet, or a card with zardozi or kundan work, or a card with embroidered tissue with favorite color schemes, can all be designed by us. They also come fancifully in silk, leather, brocade or even silver. 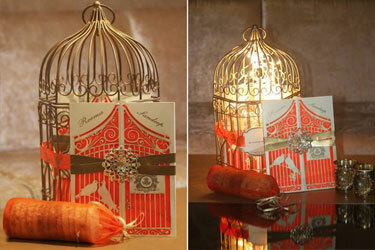 Even you can design your card according to the theme of your wedding.